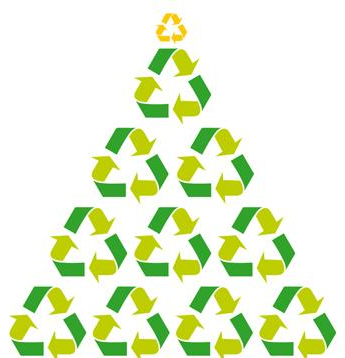 It’s estimated we in GB will create 3 million tonnes of rubbish this Xmas – enough to fill 400,000 double decker buses! That’s crazy! Can we do better? Here’s a few ideas…..
Agree a cash cap for presents for your nearest and dearest – then everyone’s playing by the same (proportionate) rules. Make a NUP (No Unnecessary Present ) pact with friends, or at least agree a Secret Santa scheme – where a group of family, friends or work colleagues agree a budget together and secretly draw names for who needs to buy for whom (one present for each recipient) . This way you need buy only one present for the group, rather than a dozen or more. Buy a live Xmas tree with roots – so you can replant after use – and use next year. Give cinema or concert tickets, or membership of a favourite museum, or similar as a present – the promise of nice experiences rather than more (often disposable) ’stuff’. Make a difference/get a warm glow from helping others: give presents to those who can’t imagine the sort of Xmas we can enjoy. www.practicalpresents.org, www.wwf.org.uk and ‘Oxfam Unwrapped’ include great gift ideas (from goats to floating gardens). Closer to home, help give a homeless person a place at a Crisis for Christmas centre – donate via www.crisis.org.uk. Check out ‘eco stores’ (e.g. www.nigelsecostore.com) for sustainable gifts: amazing! If you’re buying Xmas lights, check out LED lights: they look good and are far more energy-efficient, saving you £££s in the long run. If you’re talented in the kitchen, make chutneys, cakes or similar and give as presents. Buy/give locally-produced or recycled gifts: they’re often unique. Source from the likes of Handmade Hayfield , New Mills Gallery, flea markets and antique shops. Buy your Xmas meal from locally-sourced supplies (e.g. farmers’ markets). It’s been estimated the ingredients for the average supermarket-driven UK Xmas meal have travelled a combined 49,000 kilometres before appearing on your plate. That’s just madness! Buy rechargeable batteries – available from the likes of B & Q. Buy Brussels sprouts (yes, sprouts!) on the stalk – they’ll last 2 weeks stored outside, saving fridge space. Get your fruit and veg loose – avoiding all that unnecessary plastic packaging. And, if you need to buy some packaged food, avoid getting individual portions: so much wasteful packaging, when the fridge/freezer is available for storage. Make a few handmade/natural decorations – these can be so much more elegant and distinctive. And it needn’t mean much work. Consider: a spray or two of holly/ivy, a pine wreath, a decorated branch, beeswax candles, hanging snowflakes cut from white paper. Wrap presents in plain brown wrapping paper, with a festive ribbon, string or raffia binder: they can look very stylish! Turn off all appliances not in use. Avoid standby mode, which still uses 13-18% of the electricity needed to power them. Save ££££s! Turn off fairy lights overnight or when you’re away. If you’re prone to forget, get some timers to switch them on/off automatically. Why not be kind to yourself and plan your meals for two or three days, making best use of leftovers from the ‘big meals’, in sandwiches with/without salad garnish or especially, in nourishing stews? Re-use/recycle your Xmas cards. Cut them up for next year’s home-made cards or gift tags from them or at least take them to WH Smith/Tesco collection points where they’ll be well-used to raise money for The Woodland Trust. Let’s be honest – some of the presents we get are often unwanted. Recycle these: take to a charity shop or give away to others via e.g. www.freecycle.org. Use excess cooking fat, mixed with muesli, to make fat balls for the birds. While warm, spoon the mix into muffin cases, add a hanging string or make sure they fit your bird feeder. What would you do if you had no car, limited income, mobility problems and wanted to shop and travel to required health appointments? Ask a neighbour - again? Call on family, who may work and often live a distance away? Spend on taxis? For many people currently, local community transport services provide an economical and more sustainable door-to-door service for just folk. But, as we've advised previously, Derbyshire County Council has been consulting on withdrawal of funding for Community Transport and removal of both shopping buses and health care travel. With others, we believe the loss of this vital service will harm older, disadvantaged, vulnerable and disabled people in particular, here and throughout the county. The prospect of such cuts has already caused anxiety and distress among many service users. There is a groundswell of support to let county councillors know the strength of feeling there is. A petition asking the council not to proceed with such cuts has been organised. Thousand have already signed, with presentation of the 'completed' petition to inform a debate at County Hall in December. If you're concerned about this - on behalf of many of the most disadvantaged members of our communities - please sign the online petition below by Friday 20th November. Fossil Fuels - action you can take? At Thursday's evening lecture (7.30p.m., The Royal Hotel), Professor Kevin Anderson is bound to refer to our excessive burning of fossil fuels and their impact on climate change, and the need to recalibrate our economies towards more sustainable sources of energy. Amongst action we can take is to press public bodies to cease or limit their investments in fossil fuel industries. There's now an outlet for doing so close to home. Sustainable Hayfield has joined with a dozen similar groups around Derbyshire to support submission of an online petition to Derbyshire County Council to progressively dis-invest from fossil fuels via the Derbyshire Pension Fund by freezing any new investments and dis-invest from existing investments in fossil fuels within 5 years. The pension fund has £290 million invested in fossil fuel companies. Such a step is both environmentally justified - bearing down on a major source of greenhouse gas emissions which threaten global climate change - and financially prudent since fossil fuel investments are increasingly likely to create risks for investors if they become stranded assets (worthless fuel stocks that regulation will prevent from being burned). There is already evidence investments in fossil fuels results in reductions in the value of pension funds. And we would not wish the pensions tens of thousands of employees of over 170 employers in Derbyshire (inc.Derbyshire County Council, all the borough and District Councils in Derbyshire, Derby City Council; Chesterfield College; Derby College; Derbyshire Fire and Police Authorities; Peak District National Park Authority; University of Derby and a large group of smaller employers), to continue to be exposed to the financial risks of such a sector, when safer, alternative, investment options exist. Institutions across the world including churches, universities, local authorities in the UK such as Bristol City Council and Oxford City Council, and the Environment Agency, have already committed to divest from fossil fuels. If you would like to support/sign the petition, here's the link with more information. 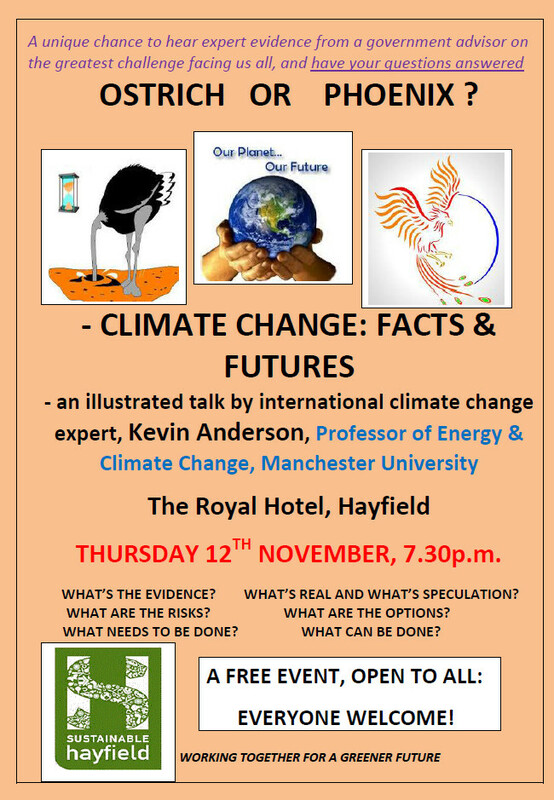 You've maybe seen posters in the village promoting the climate change presentation we're hosting at The Royal Hotel a week today, November 12th, with Professor Kevin Anderson. Attached is your own poster, as a reminder, to whet your appetite. Chris Lea from Buxton says “He’s a top man in his field. I’m coming with friends. We’ll get an expert view”. The event starts at 7.30p.m. Prof Anderson's presentation will last about an hour and then he'll answer questions. His international expertise should make it a really informative evening. 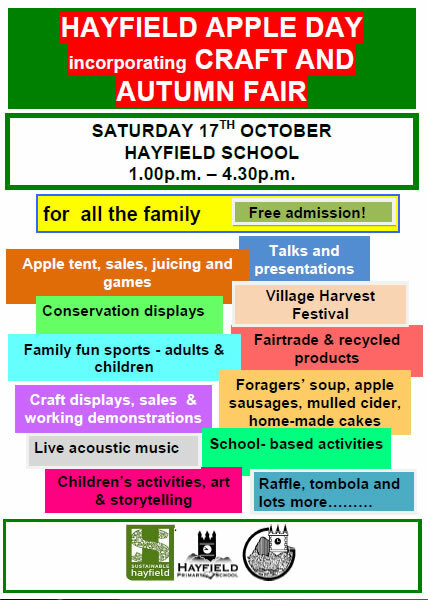 We hope to see you there - you might need to be early! ‘Green’ – What’s In A Name? News You May Have Missed? Please click 'here' to download your copy of our autumn 2015 newsletter, bringing you up to date with local activities, wider developments and events to come. Please click 'here' to download your copy of our summer 2015 newsletter, bringing you up to date with local activities, wider developments and events to come. Please click 'here' to download your copy of our spring 2015 newsletter, bringing you up to date with local activities, wider developments and events to come. There's great news about prospects for funding of a second community minibus, and how you can help. There's also scope to get involved at the Library Garden April 19th. 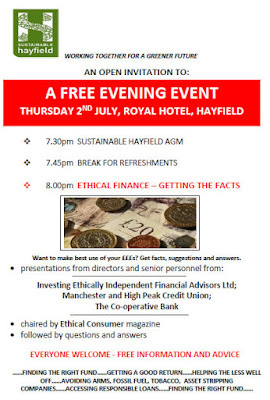 And we'd particularly welcome your attendance (and maybe even your question(s) in advance!) 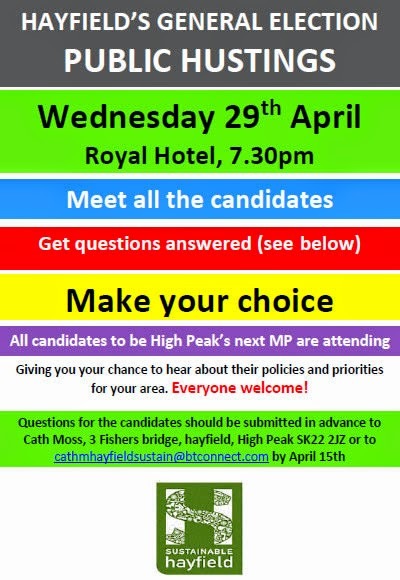 for Hayfield's own General Election Hustings which we're hosting April 29th. But, of course, we welcome seeing you at any activity and your response to invitations extended throughout the newsletter. See you soon, hopefully! Winter Newsletter - and a chance for you! Fun Quiz: What D’Ya Know? Please click 'here' to download your copy of our winter 2015 newsletter, bringing you up to date with local activities, wider developments and events to come. 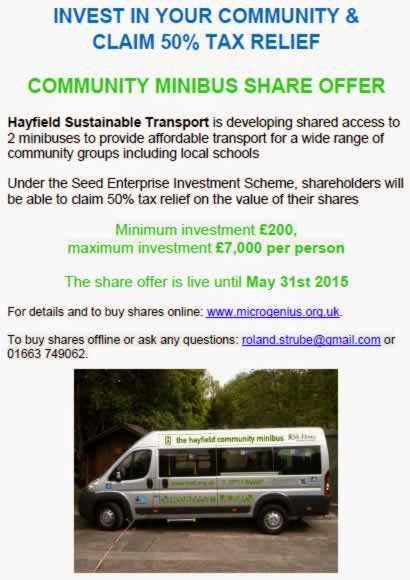 Please take a particular look at how you can influence the shape of local sustainable transport, supporting the further development of the village's community minibus service. Let us have your views - see pages 2 and 3 of the newsletter.